Being stuck in a crate during a flight can stress out even the calmest kitty. While you might be looking forward to an upcoming cross-country flight or international move, your kitty probably doesn't share your enthusiasm. 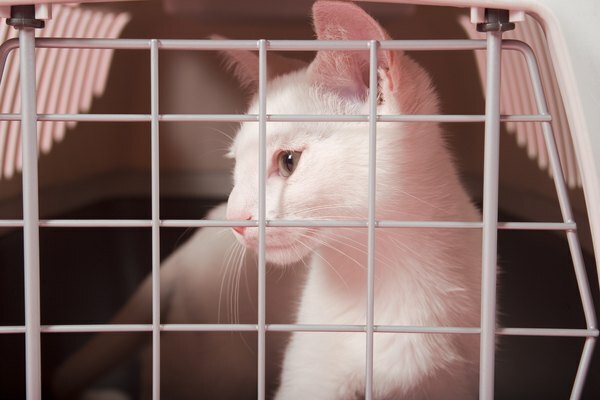 Flying isn’t the ideal way to transport your feline companion, but you can take steps to minimize her stress along the way. Planes can be scary even for humans, and when your cat doesn't understand what is going on, that makes the flight even more terrifying. Cats tend to like familiar places, so just being away from his home territory can lead to stress. In addition, a plane is full of unfamiliar, and sometimes vaguely threatening, sounds, smells and sights. Most cats also hate being confined, so being stuck in a crate and unable to escape to safety piles on the stress even more. Before your flight, get your cat used to her crate, so at least she will feel comfortable with the carrier she's in. If you already have a carrier that your cat associates with vet visits and other negative experiences, try getting a new crate in a different style and color so she can feel more at-ease. Spend a few days sleeping with a soft blanket or a few cat toys, then place those items in her carrier so she has something embedded with her favorite person's scent while she is on the plane. About 30 minutes before you head to the airport, spray down her carrier with a feline pheremonal spray. If possible, keep your kitty with you in the cabin instead of banishing her to the cargo area where she can't see or hear you. If you are considering medicating your cat for the flight, talk to your vet about which sedative or feline anti-anxiety medication to use. If your flight will be a long one, the medication might wear off midway through, so find out how long a single dose lasts and make sure you know how to administer more if necessary. You may have to give your cat a test dose a few days or weeks before your flight to see how she reacts to the medication. If your cat will be shipped instead of being in the cabin with you, she should not be sedated for the trip. Sedation can hamper breathing and could endanger your cat's life. If you are apart from your cat during the flight, check on her as soon as possible once you land. Seeing you and getting a cuddle can help reduce her anxiety levels and make her feel safe again. If your pet is prone to stress, opting for another mode of transport might be the easiest solution for everyone.